Governor of Poker 2 for Mac starts where the first game ended, but nothing is what it seems to be. A new Dallas government has entered and decided to put a ban on all poker games and consider the game to be illegal. Whats even worse you lost your title of Governor of Poker because of all this! Its up to you to convince the minister of the Texas gambling committee and show him poker is all about skills! Fight the ban on Poker! Qweas is providing links to Governor of Poker 2 for Mac 1.0 as a courtesy, and makes no representations regarding Governor of Poker 2 for Mac or any other applications or any information related thereto. Any questions, complaints or claims regarding this application Governor of Poker 2 for Mac 1.0 must be directed to the appropriate software vendor. 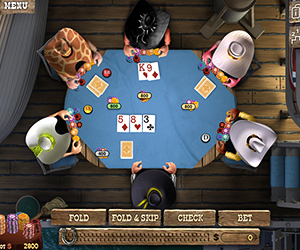 You may click the publisher link of Governor of Poker 2 for Mac on the top of this page to get more details about the vendor.